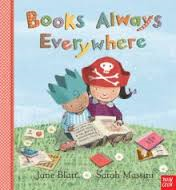 This week we have a guest blogger, Jane Blatt, who is the author of a picturebook which is all about books. Her reflections show how relevant the topic and representation of books is even for the youngest of audiences. Books Always Everywhere came about when Evelyn and I were reviewing data for a chapter on how picture books can support the emotional learning of bilingual children (Arizpe, E. and Blatt, J. 2011 ‘How Responses to Picturebooks Reflect and Support the Emotional Development of Young Bilingual Children’, in B. Kümmerling-Meibauer (ed) Emergent Literacy. Children’s Books from 0 to 3. Amsterdam: John Benjamins). We were watching a video of an 8 month baby exploring books on her own. She was sitting on the floor surrounded by all kinds and sizes of children’s books and for some moments explored one in particular. She picked it up, dropped it, mouthed it, moved it with her foot, opened it, felt it, weighed it in her hands, smelt it, even looked at it from different angles, maybe even noticed that there were different shapes or images on different parts of it. Her whole body was focussed on the task she had started and continued on her own and for herself. There were the occasional concentrated grunts from her totally integrated body but no one told her what to do and certainly no one ‘helped’ her in her exploration. Later, in another clip with this baby a few months later, we saw her making a mat on the floor with books, then making the books into houses for small figures. She piled them and built with them. She lay down with them and even put one of them on her head as if it were a hat. She was gaining more and more experience about the joys of the ‘bookness’ of books. She was also learning about ‘placing’, ‘matching’, ‘sorting’, ‘sequencing’, ‘building’, ‘banging’ and building up her early general learning. A variety of formats and sizes of books are represented in Books Always Everywhere –board books, buggy books, books with holes- and the illustrator has added images and words in some of them. The words and titles are of course meant for the literate reader; some are real titles of fairytales and nursery rhymes, others are made up as a joke that can be shared with babies too, such as the book called ‘House Mouse’ upon which a small mouse is sheltered by a book opened in the shape of a tent – much like the books in the photograph. There is certainly lots to look at in the illustrations and one can easily imagine much ‘spotting’ going on when the book is shared with an adult. The words and the pictures also suggest relationships: ‘Book Give/Book Share’, and a way of engaging with others and participating in a community. The book has been very successful. Is part of its success due to it being a book about books in this technological world when books are being replaced by the ibook? Are parents concerned that even babies are exploring digital gadgets too early, or that they may not encounter books in the same way as previous generations? Going back to my initial idea, unlike ipads or kindles, books can be played with as toys, put on one’s head, sat on, given as presents, used to build a house, dropped, hung from a tree, even. Will this generation of babies miss out on learning about the ‘bookness of books’? Are our children losing out on the playfulness of play? Does this matter? Will this book be seen in the future as a quaint and outdated defence of books? Or will there still be, as the title suggests and is summed up, with all the aspects of the babies’ enjoyment of books in the final illustrations, ‘Books always.... everywhere? I am busy reading for next year's UKLA children’s book award at the moment – and I was pleased to see Jacqueline Wilson’s Four Children and It in the parcel from Puffin. “What’s that you are reading?” said Smash, grabbing the book out of my hand. And with an economy of style that seems to me to be one of Wilson’s special talents, we are shown that Smash is disruptive and difficult. Three sentences on we know that Rosalind is not. 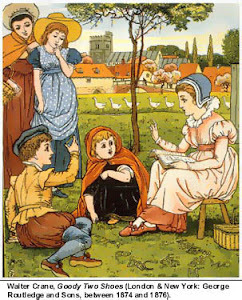 She is reading E. Nesbit’s Five Children and It, - with enjoyment and in the original ( Thank you Peter!) and it is not one whit too difficult for this modern child. She can concentrate. The book, as you probably know, was written as a tribute to Nesbit’s, which Wilson loved as a child. It borrows Nesbit’s plot wholesale. The children ( this time three and a baby, rather than four) dig up the Psammead, and he grants them wishes which invariably go wrong in some way. One wish – the ability to fly occurs in both stories, though the consequences are different for the modern children. Despite Wilson’s deceptively easy style, hers is ( I think) the more complex piece of writing. As well as the the story of the wishes, there is another story here of modern family life. This is a step family thrown together for the holidays. Two children share a mother, three a father, and only one child is in its permanent home. There are tensions between the children, between the children and their parents, between the children and their step-parents, and between the two adults about each others' children. Adults feel guilty, children feel rejected, and every one, (except baby Maudie who is gloriously secure) is negotiating a place in this muddle. it is a story of accommodation and compromise and there are no easy answers, even when wishes come true. And then there is the intertextual complexity. This is a book based on a book, in which the book features as an object and as a story. Even the characters of the original have a part to play when Rosalind wishes she could meet them – and does. This weaving in and out of various levels of story and of time is relatively demanding of the reader. At the same time I felt a strange itching, burning feeling on my back. Smash felt behind her. Robbie started scratching his own back and Maudie peered over her shoulder, startled. The strange feeling grew stronger so that my shoulder blades pricked fiercely, as if they were being pushed right through my skin. I could actually feel them poking through the thin material of my T-shirt. I twisted round worriedly, and felt something sharp and then soft, like a feather sticking out of a pillow. A feather! “Oh goodness, I think we are growing wings!” I gasped. Wilson makes me feel those wings growing. It is her capacity to make me imagine what it is like to grow wings and what it is like to be caught up in the emotional complexity of many modern day families, that makes her writing worthwhile. So what that the plot is borrowed! I notice I have said almost nothing reading and readers in the novel. Perhaps next time?